* 20pcs bright lED beads provide with uniform light. * LED light powered via a USB cable. your need to shooting the photos. ---If you're not satisfied with your purchase from our Depthlan shop, please feel free to contact us anytime. We will reply you within 24 hours for a refund or replacement. SMALL SIZE -- 9*9*9.5 inches, perfect for shooting small products such as toys, jewelry, watch and etc. EASY QUICK SETUP -- Built-in magnet and folding design for easy and quick setup at any where and time. EASY CARRY AND STORAGE -- Depthlan Photo Studio Box No bigger than a piece of A4 paper after folding. Easy to carry and compact for storage. 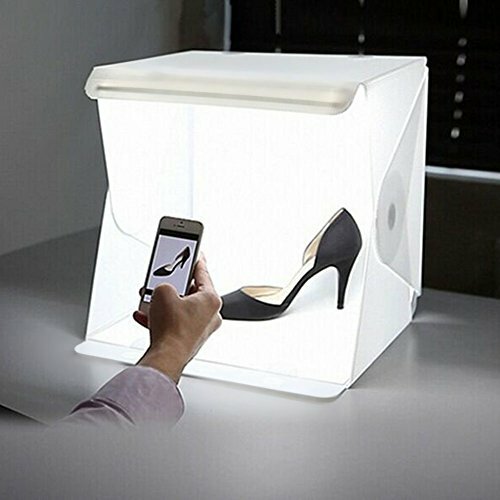 PREVENTS SHADOWS AND REFLECTIONS -- Built-in 20pcs LED lights---providing uniform light and prevents shadows or reflections in your photos. DIFFERENT BACKGROUNDS -- With back and white background backdrop, focusing your photography for professional and beautiful pictures. If you have any questions about this product by Depthlan, contact us by completing and submitting the form below. If you are looking for a specif part number, please include it with your message.